This is, quite simply, the best bean dip I ever had. But before I waste your time, please don’t bother reading further unless you really like spicy food. This is definitely not a dip for everyone, but if you’re partial to Mexican food and can stand some heat, I guarantee this will win your heart and move to the top of your Favorite Appetizers list. My first indication we had a winner on our hands was the nineteen positive reviews from Fine Cooking. Those readers don’t hold back any criticism, however minor, and I’m always surprised to find several poor or lukewarm ratings for recipes I love. If nineteen Fine Cooking readers find something worthy of praise, I figured the recipe must really be special. And it is! The down side is that it takes a bit more work than your (my) usual slap-together concoction. It’s certainly not difficult, but it does require dirtying a saute pan and a food processor. The plus side is that you can make it up to two days ahead and it will keep nicely in the refrigerator, so you’re not messing around too much in the kitchen before a party — just bake at 425 for 15 minutes and serve. Many of the comments cautioned about using 3 tablespoons of cider vinegar, so I cut back to two tablespoons. Other than that, I followed the directions to the letter, and it came out perfectly. Heat the oven to 425ºF. Grease a 1-1/2 qt. baking dish with oil and line a baking sheet with foil. Set the tomatoes in a colander over the sink and sprinkle with 1 tsp. of the salt. Heat the oil in a large (12-inch) skillet over medium-high heat until shimmering hot. Reduce the heat to medium, add the onion, sprinkle with 1 tsp. salt, and cook, stirring, until softened and translucent, 4 to 6 minutes. Add the garlic and chili powder and cook, stirring, for 1 minute. Add half of the black beans, the chipotles and adobo sauce, and 3/4 cup water and bring to a boil. Cook until the liquid reduces by about half, 2 to 3 minutes. Heat until shimmering hot. Reduce the heat to medium, add the onion, sprinkle with 1 tsp. salt, and cook, stirring, until softened and translucent, 4 to 6 minutes. Add the garlic and chili powder and cook, stirring, for 1 minute. 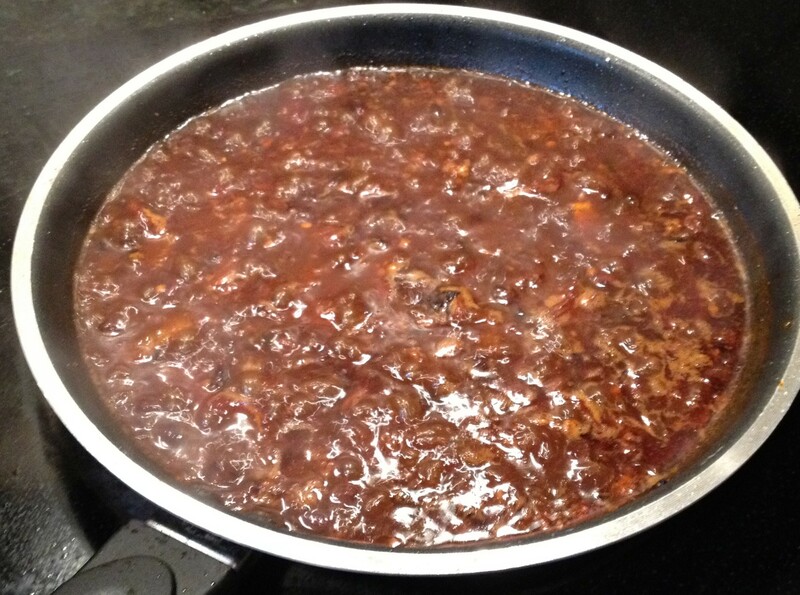 Add half of the black beans, the chipotles and adobo sauce, and 3/4 cup water and bring to a boil. Cook until the liquid reduces by about half, 2 to 3 minutes. Transfer the bean mixture to a food processor, add the vinegar, and process until smooth. Let cool for a couple of minutes and then transfer to a large bowl. 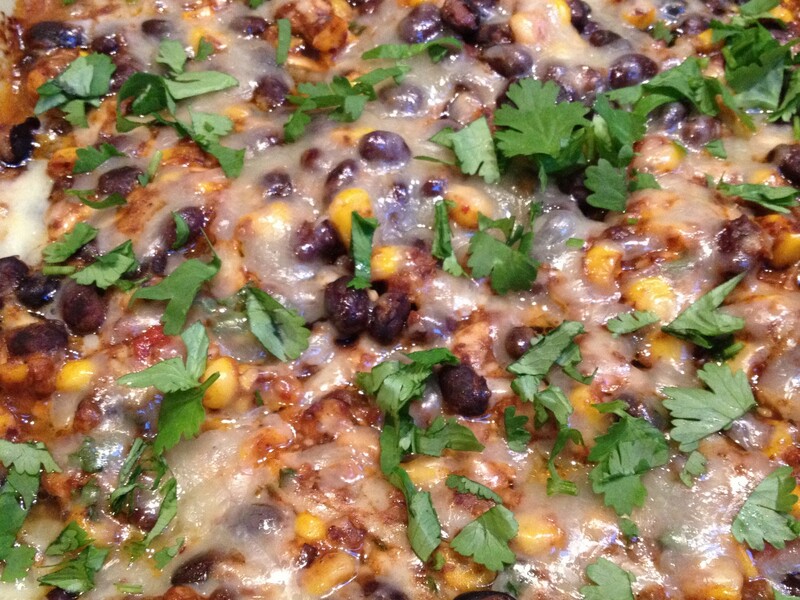 Add the rest of the beans, the tomatoes, corn, half of each of the cheeses, and 1/2 cup of the cilantro. Mix well and season to taste with salt and pepper. Transfer to the baking dish and sprinkle with the remaining cheese. Bake on the foil-lined baking sheet (to catch drips) until the cheese melts and browns around the edges, about 15 minutes (longer if refrigerated). Sprinkle with the remaining cilantro and serve with the tortilla chips for dipping. This entry was posted in Appetizers and tagged black bean dip, Fine Cooking warm black bean and chipotle dip, spicy black bean dip by Mom Mom's Apron. Bookmark the permalink.